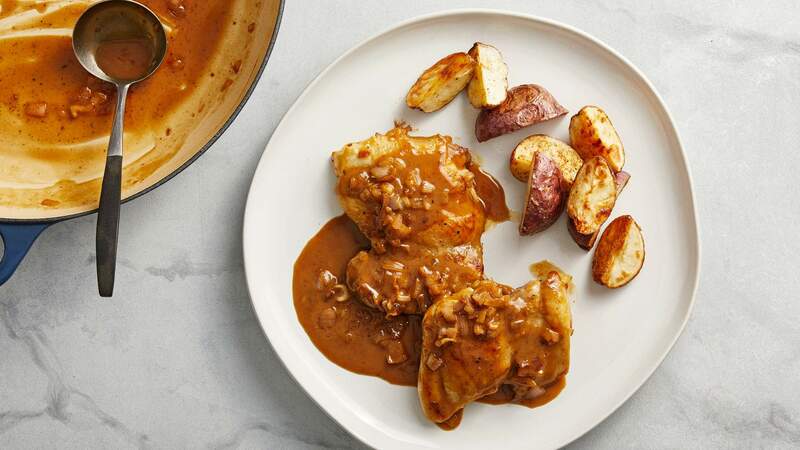 You can easily enliven dinner with simple pan sauces. The process has two parts: 1. capturing flavor deposited in the pan by the ingredient you just cooked, and 2. enhancing that flavor. Protect the browned bits and add to them. Pour off any rendered fat, but take care to preserve that fond. If you wish, add finely chopped shallot or onion, garlic, fresh chile, bell pepper, something to add fragrance and flavor – an “aromatic.” Saute just until softened but not browned, again taking care to not burn the fond. (I’m going to make T-shirts that say “Don’t Burn the Fond.”)Deglaze, twice. This is the dramatic part. I first deglaze with a “strong” liquid to provide a nervy backbone to the flavor, such as wine, vinegar or a spirit such as brandy. Then I add a second liquid – the “body” liquid – which mellows the intensity of the first liquid and gives you a greater volume of sauce. Good body liquids are chicken or vegetable broth, apple cider and – for a luxury effect – cream.To deglaze, adjust the heat so your pan is hot but you’re not going to burn the ... you know. Then pour in your strong liquid (see below for amounts). It should sizzle energetically, but it shouldn’t evaporate immediately; if that happens, add a spoonful or two of water to reconstitute. Stir and scrape the pan so that the juices are fully dissolved. Reduce. This simply means to boil a liquid so the water evaporates and the flavor compounds remain, thereby concentrating flavor and texture. Reduce your strong liquid to the point that it loses any harshness (always important when deglazing with wine), but not so much that you have no volume of liquid left; you want about a tablespoon.Now add your body liquid and reduce to about a third of the original volume (if your chop has given off some juices as it rests, pour them into the pan, making sure you bring them to a boil as well). Taste to find the perfect point, but generally more reduction is better than less, even if you end up with only a few spoonfuls of sauce. Add your extras. Now is the time to add Dijon mustard, capers, lemon zest, fresh herbs or, heck, cacao nibs if you want. Just be sure the flavoring ingredients don’t need further cooking because you’re almost finished. The sauce will have enough body at that point to leave a clear path when you draw your spatula through it.Enrich. The final step, which is optional but I recommend it, is to add a touch of cold butter, cream, creme fraiche, maybe even finely grated Parmigiano-Reggiano, which will round out any sharp edges, unlock a few more flavors and produce a luscious texture.Taste and adjust. You’re not quite done. As with anything you cook, do one final flavor check to dial it in: Taste, and a touch more salt, a grind of pepper, maybe a squeeze of lemon juice or more butter (always the right answer).The brilliance of a pan sauce is its ability to adapt and improvise, so as you grow more comfortable with the process, you’ll devise your own flavor combinations. To get you started, here are two of my favorites, with approximate amounts. Mustard-Cream Pan Sauce: 1 tablespoon finely chopped shallot, ¼ cup brandy, cognac or dry white wine, ¾ cup low-sodium or homemade chicken broth, 1 tablespoon whole-grain mustard, ½ teaspoon chopped fresh rosemary, ¼ cup heavy cream or creme fraiche, a squeeze of fresh lemon juice, salt and lots of black pepper. Martha Holmberg is the author of “Modern Sauces” (Chronicle, 2012) and co-author with Joshua McFadden of “Six Seasons: A New Way to Cook Vegetables” (Artisan, 2017).